During the Festival, those who requires it, will have the possibility to find a vibrational vegan raw food court. Anna Maria Baldi and Vincenzo Canoro are waiting you with the “Vibrational Cooking”, completely veggie and raw, with fresh and organic ingredients. This year we are going to present a menu for breakfast, lunch, afternoon snack and dinner which includes drinks based on Kefir and apple juice, infusions and a wide choice of food for the body and for the soul: fruit and vegetable extracts, spicy summer soup with Miso, vegetable creams, zucchini’s lasagne and spaghetti, sauces of basil pesto, raw tomato, lupin mayonnaise, salads and desserts for every taste with pre and probiotics products. It will also be possible to buy fruits and vegetables in bulk for those who wish to cook independently. We accept card payements. Vincenzo Canoro, free searcher in the natural food’s field, vegan since 2008, raw foodist since 2012, gives theoretical and practical workshops, conferences and meetings around the vegan ethic, and also nutrition and vegan raw food cooking. In his researches he is moving towards food vibration and electromagnetic field’s effect of aliments on health. Festival hummus, chickpeas with lemon, Cannellini beans with rosemary, Lens with rose pepper, Trio of legumes spaghetti with souce, rice Samosa with potatoes and peas, potato and onion pie, Breatharian Taboulè, cereal salad, legumes fritters…. Gille Casaburi, born in France, has learnt about macrobiotic philosophy since 1991, following the Giorgio Ohsawa’s teaching. For 20 years he has followed this discipline taking part to the opening and management of some restaurants. 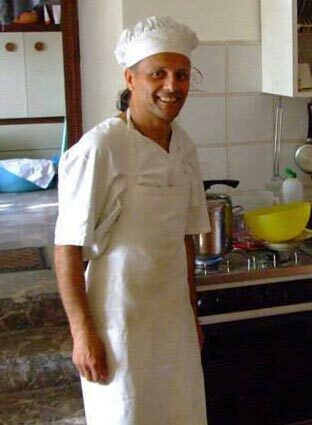 In 2012 he widened his experience and he became chef and natural health cooking teacher by the Hospital Cancer Ward in Macerata and in the Valdo Vaccaro’s Health Science University in Imola. His source of inspiration was the famous St Ildegarda’s from Bigen healing diet. Also thanks to a progressive diet change you can experience a state of freeing and awareness, in respect of your own time. This allows you to be able to experience the pranic diet and reach a Peace and Union state.